OK, just want to go back to chronological order. 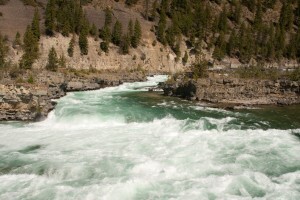 I left Spokane heading north on a small, narrow, curvy road that runs parallel to hwy 2. Sometimes, I ask myself why I choose these roads and I quickly remember when I am back on major roads with all the traffic and no place to stop. When I drove to Spokane I was surrounded by wheat fields and desert and now I was once again surrounded by pine trees and some birch trees that showed already their fall colors and it was only early September. Originally, I thought I would drive through Coeur d’Alene and then go up north; however, I had no interest to go back on I-90 with crazy drivers. So I opted for highway 2. 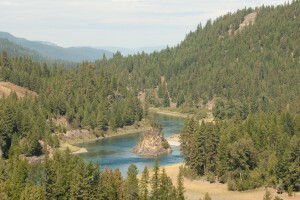 Highway 2 leads through the narrow panhandle of Idaho with lot’s of pine and mixed tree forests. A stark contrast to southern Idaho with its lava fields and a much more barren landscape. Before I knew it I had almost driven through Idaho with only one little stop in Bonners Ferry for lunch. No, no, I can’t just drive through this beautiful place and not haven taken a single photo. So, instead of continuing into Montana, I stopped in Moyie Springs, twelve miles west of the Montana border, and stayed at the Twin Rivers campground. 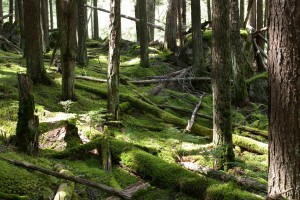 The campground was down in a valley at the confluence of the the Kootenai River and Moyie River. The road down to the campground was pretty steep and of course a dirt road. The drive down was definitely worth it. My site was surrounded by pine trees and the river was just 50 yards away. What a difference to the asphalt lot I stayed in the night before. I spent the afternoon walking along the river, just enjoying the peace and quiet, skipping rocks. OK, nothing is ever perfect. At the top of the mountain was a lumber mill with the equipment running 24/7. The noise was not very loud, but annoying enough when I tried to fall asleep. I managed to leave early the next morning, but was robbed by one hour as soon as I crossed into Montana. I do prefer heading west where you gain an hour. The scenery just got better. I don’t know if you ever watched the 1992 movie “A River Runs Through It” directed by Robert Redford with Brad Pitt. 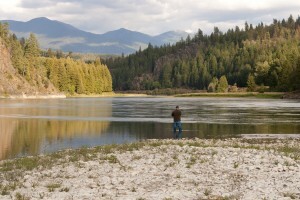 If you haven’t, google it and watch the fly fishing scene, then you know what I looked at throughout my drive thru eastern Montana. There are many wide mountain rivers and I couldn’t help but to constantly think of that fly fishing scene, gorgeous. 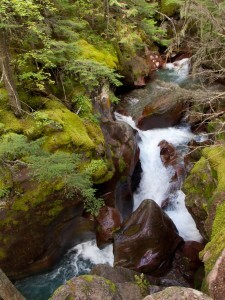 The drive to Glacier National Park lead through forests and mountains with rivers running along side the road. The mountains ran parallel to the road until I arrived in Kalispell and I all of a sudden faced this huge mountain range right in front of me. The Rocky Mountains. Wow, what a site. These are truly impressive mountains. Fortunately, I didn’t have to drive over them at this time. 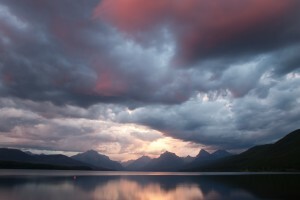 At Glacier I camped at the Apgar campground right in woods by Lake McDonald. No electricity or running water. That solar panel on the top of my camper came in very handy, kept my batteries charged for the four days I stayed in Glacier. Glacier is quite incredible. 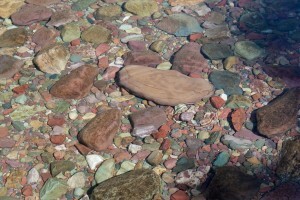 I have never seen clear water like that in Lake McDonald and the rivers around it. Mountain reflections in the lake look like paintings. 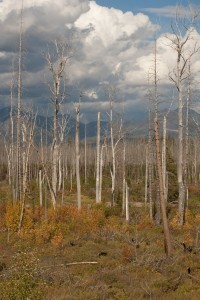 One of my excursions led to Bowman Lake, north west of Lake McDonald. It was supposed to be this very quiet spot not too many people travel to. Well, there were not too many people, but it wasn’t quiet. Unfortunately, sound traveled extremely well at the lake and I could follow people’s conversations from several hundred feet away. So much for a quiet place. 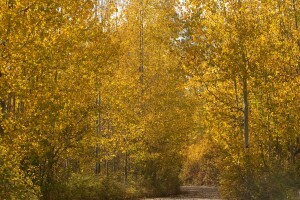 There are two roads that lead to Bowman Lake, the Inside North Fork Road, 30 miles of not so fun dirt road. Took me over three hours to get to the lake. The other route is on Camas Road and the Outside North Fork Road. A mix of asphalt and dirt road, but not anywhere as bad as the inside road. Took just over one hour to get back. 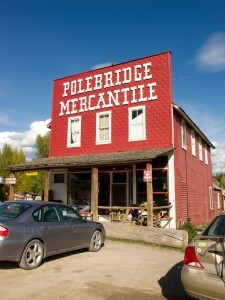 Treat yourself to some great baked goods at the Polebridge Mercantile just before Bowman Lake. The huckleberry bear claw was wonderful. I wish I had taken the Outside road in both directions. The other excursion was a four mile round trip hike to Avalanche Lake. I usually don’t go on these slightly longer hikes, but I was told I definitely should, so I did. It was a mostly uphill hike. 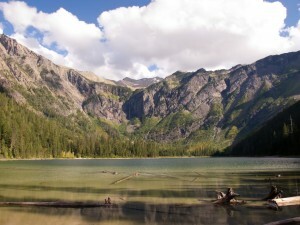 Avalanche Lake is completely surrounded by mountains. On the eastern side, several waterfalls run down the mountains, very cool. Despite the fact that there were a bunch of people, it was peaceful. I stayed for a while just marveling at the sites. I don’t know what possessed me, but I had to run back. It was downhill and who can resist running downhill? I wasn’t dressed for a run, but I have to say I made pretty good time, 25 minutes for two miles over roots and rocks is not too shabby. I slept well that night.